Origin b2 Solo has been discontinued. Accessories are still available for your Origin b2 Solo click here. The Origin b2 Solo Driver Safety and Information System is the most technologically advanced product on the market and provides a comprehensive range of speed management information in a user friendly format. The Origin b2 Solo has all the features of the multi award-winning Origin b2 but also incorporates a unique integral antenna in the cradle. This makes the b2 Solo detector much more "plug and play" and will ensure that you find it even easier to install. Hidden connector ports on the side of the cradle are another new feature that gives the whole set-up a much more discreet and streamlined appearance on the dashboard. The unit's sleek new black finish also makes the backlit LCD display stand out even brighter. ‣User definable and programmable setting for over-speed warnings. The Origin b2 Solo has been designed for easy installation into any car by the user. The Origin b2 Solo cradle is mounted on the vehicle dash top or on the front of the dash, in the drivers line of sight. The plug and play Origin b2 Solo cradle also easily fastens onto the vehicle dash top. Neither system requires drilling or damage to any surfaces and both take power from the cigarette lighter adaptor. The GPS antenna and console must be installed in the vehicle. An independent professional installation is not required. All required accessories for installation are provided including the cigarette lighter power adaptor. The Origin b2 Solo uses the Origin360 award winning database of speed camera and accident blackspot locations to provide the most accurate and up-to-date information available - all downloaded via your PC and the suppilied USB docking station. 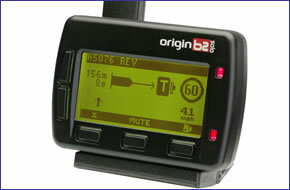 Origin b2 Solo speed camera updates are free for six months, thereafter a charge of £50 per year applies. Want to add accessories to your Origin b2 Solo? We sell a vast selection of genuine Origin parts and accessories.